Input and pictures from several Rav list members. 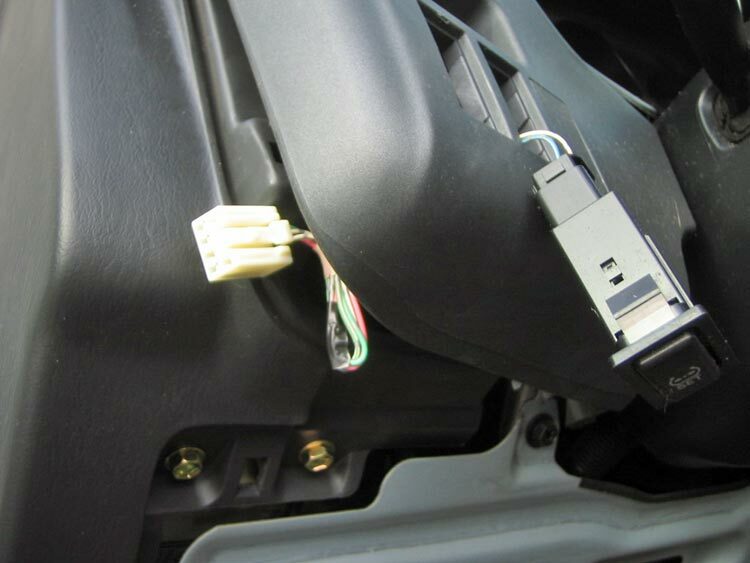 The factory Snow Mode switch can still be purchased (PN– 8472042030) from Toyota. And as luck would have it, the harness is sitting right there handy as well. Super-easy mod to add the switch if you live somewhere with slippery winter driving. The switch normally fits in the switch panel to the left of the tire inflation monitor reset switch (switch can be modified to fit in any of the holes though). The connector is bundled in the harness that goes to the reset switch. Needle nose pliers can be used to fish the harness out from behind the panel after removing the plastic filler covering the switch opening. Gently pull the connector out of the opening and connect it to the switch. The wrong connector cannot be installed onto the switch as connectors are keyed to only mate to the correct switch. 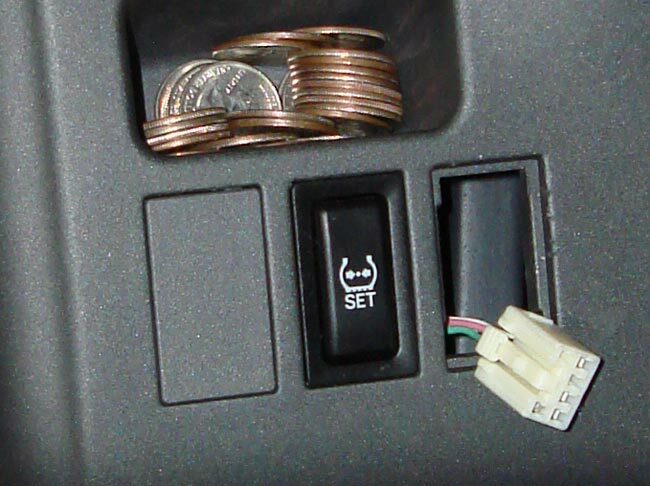 If the connector cannot be fished from behind the switch panel, you will have to remove the panel under the steering wheel (two screws and some clips) to access the connector. After the panel is removed, reach up in the area of the switch with your hand to get the connector to come out of the hole. If you need more room, you might have to remove the metal support located behind the panel you just removed. After connecting the harness to the switch, snap the switch into place in the panel. The switch is illuminated with the dash lights. 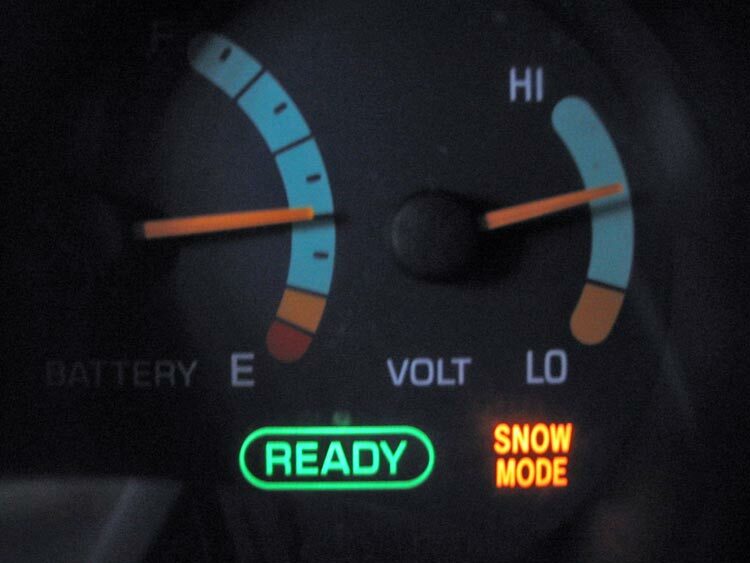 Before using, please note the owners manual caution about use of the snow mode switch when the vehicle is moving. Here is the harness coming through the chosen switch hole. In place and ready for action. 2017: Folks are having trouble locating the factory Snow Mode switch. Good news! You don't need it! First remove the switch cover and fish out the 4-wire harness as explained above. The solid green wire has power when the car is on. The pink and white with black stripe wires turn on the Snow Mode when shorted. The white with green stripe wire doesn't seem to do anything, and I couldn't find it noted in the electrical wiring diagram. Perhaps this was going to be for some other mode that was not implemented. Cut off the factory connector and crimp on 3 wire connectors. Any 12V switch will do. (one option, Radio Shack #2750012 SPST 12v Illuminated Switch) and connected the green wire (power) to terminal 3, pink wire to terminal 1 and white with black stripe wire to terminal 2 (the white with green stripe wire was not used).